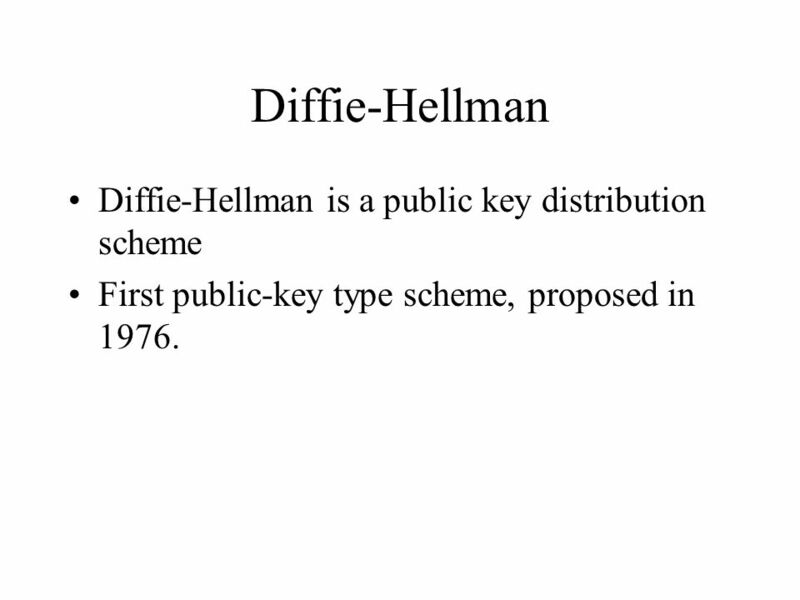 Diffie-Hellman Diffie-Hellman is a public key distribution scheme First public-key type scheme, proposed in 1976. 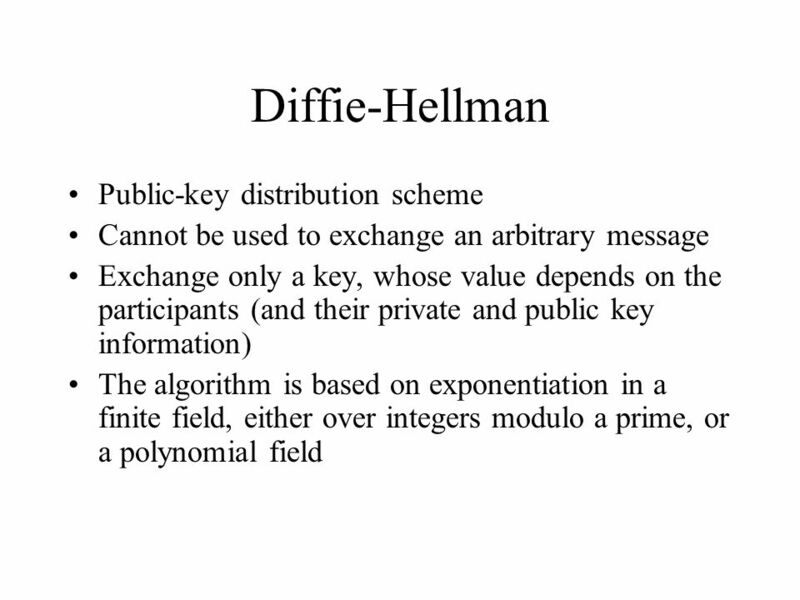 1 Diffie-Hellman Diffie-Hellman is a public key distribution scheme First public-key type scheme, proposed in 1976. 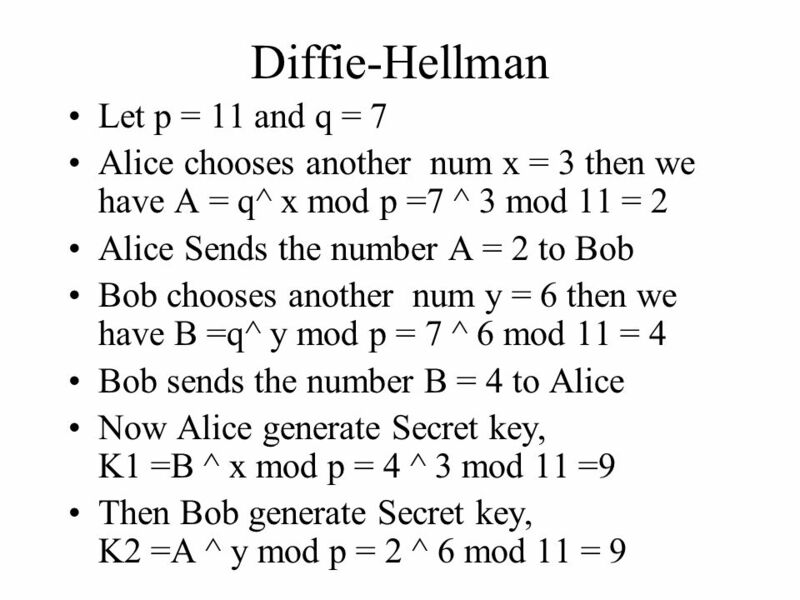 Download ppt "Diffie-Hellman Diffie-Hellman is a public key distribution scheme First public-key type scheme, proposed in 1976." Public Key Cryptography INFSCI 1075: Network Security – Spring 2013 Amir Masoumzadeh. 1 390-Elliptic Curves and Elliptic Curve Cryptography Michael Karls. Digital Signatures and applications Math 7290CryptographySu07. OOP/Java1 Public Key Crytography From: Introduction to Algorithms Cormen, Leiserson and Rivest. Elliptic Curve Cryptography (ECC) Mustafa Demirhan Bhaskar Anepu Ajit Kunjal. Windows Core Security1© 2006 Microsoft Corp Cryptography: Helping Number Theorists Bring Home the Bacon Since 1977 Dan Shumow SDE Windows Core Security. Public Key Crytography1 From: Introduction to Algorithms Cormen, Leiserson and Rivest. 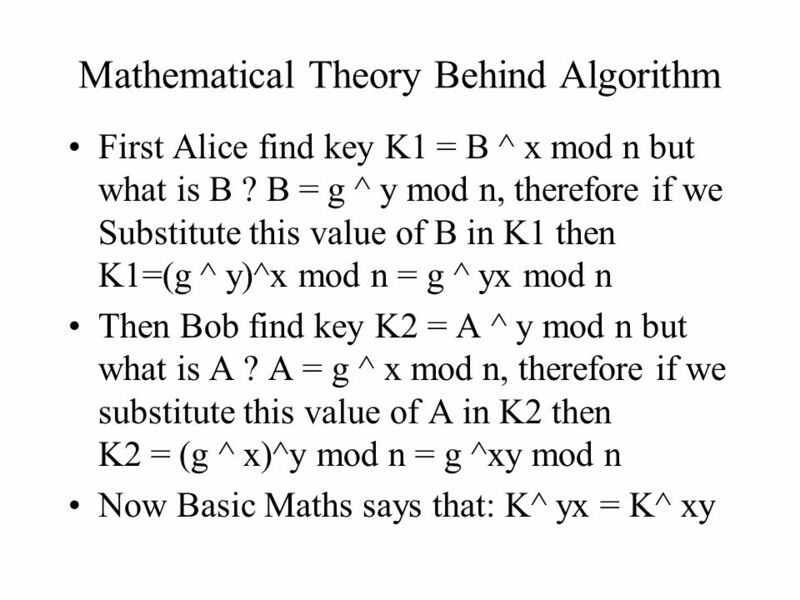 Introduction to Modern Cryptography Lecture 5 Number Theory: 1. Quadratic residues. 2. The discrete log problem. 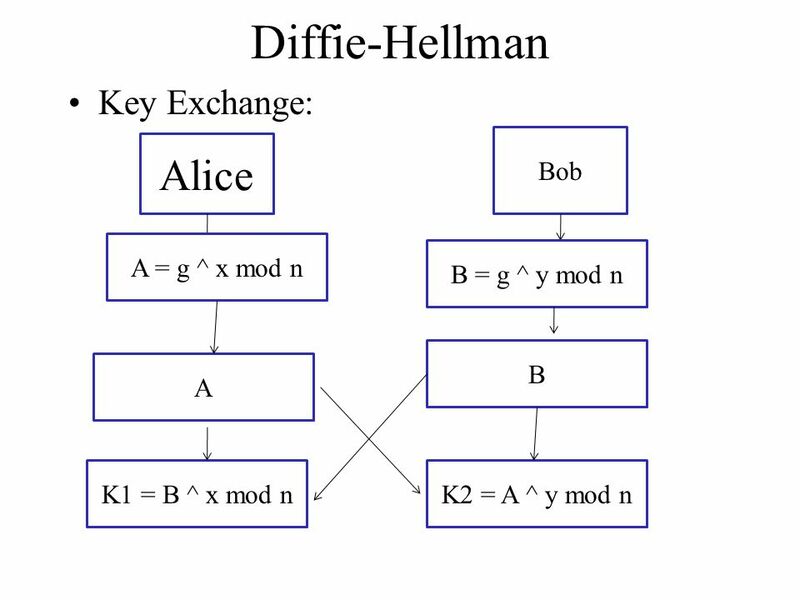 Intro to Public Key Cryptography Diffie. No-Key Cryptography Nathan Marks Based on Massey-Omura US Patent # 4,567,600. WS Algorithmentheorie 03 – Randomized Algorithms (Public Key Cryptosystems) Prof. Dr. Th. Ottmann. Introduction to Modern Cryptography Lecture 7 1.RSA Public Key CryptoSystem 2.One way Trapdoor Functions. 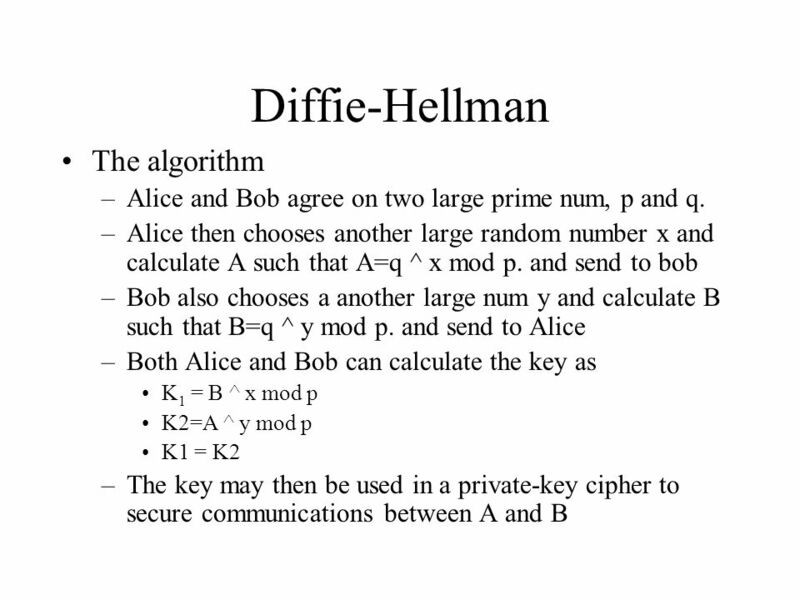 Key Management and Diffie- Hellman Dr. Monther Aldwairi New York Institute of Technology- Amman Campus 12/3/2009 INCS 741: Cryptography 12/3/20091Dr. Monther.